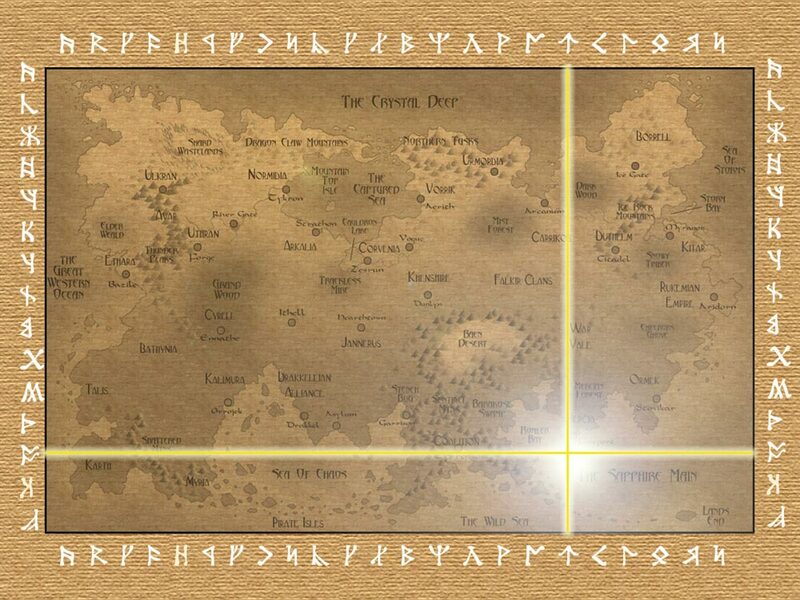 The first skull indicated by the map is that of Sirrenul, an elven mage. After the war, Sirrenul retired to Mercia to live out the rest of his life in peace. Sirrenul is buried in a modest grave in an abandoned graveyard beside a ruined church. The ruins lie on the south coast of Mercia (the end of the southern peninsula) not far from the village of Ballerus. The player characters follow the map to the first set of coordinates where the first skull is located. You can throw any kind of obstacle or encounter you like at them during the trip. The skull is currently held in a castle which is the home of a necromancer witch and her minions (a collection of bandits, brigands and a sizable group of lesser undead including skeletons and zombies). Once each week, the necromancer witch goes out at night with a number of her bandits and they dig up corpses from an old graveyard on the coast. These are used to make more undead. She has a small horde in her castle. Several nights ago, she dug up a body that radiated magic. Intrigued, she took the skeleton back to her castle to study it. She does not realize yet what she has found. The witch is a spell caster who specializes in necromancy. Her name is Sathulga and she is an ancient crone who has dabbled in dark magic all her life. She has amassed great power and magical talents over the decades. She is thoroughly evil. She uses her magic to animate dead bodies, turning them into walking abominations of bone and withered flesh that serve her unquestioningly. These silent horrors serve her in as guards and soldiers. In addition to the undead, she has allied herself with a small group of bandits. These men of ill repute now serve her as they see the advantage to serving a powerful figure. Leading the bandits and serving as the witch's lieutenant is a dark knight, a skilled but black hearted knight, exiled from distant lands. His name Damerik the Unholy. Both the witch and the knight are worshipers of Barulda, Lord of Worms. The bandits are mostly thieves and brigands who worship rum and gold more than anything else. 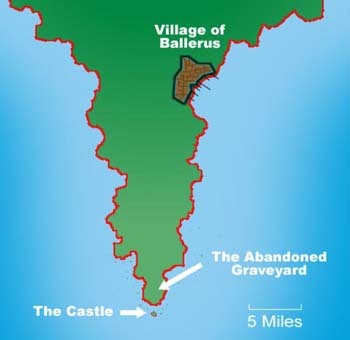 After following the map to the castle, the characters should, at some point, try to sneak into the castle and steal the bones. At this point, it becomes a good old fashioned dungeon crawl, with a variety of brigands and low level undead as the main adversaries. The dark knight and the witch serve as the climax opponents. 1. 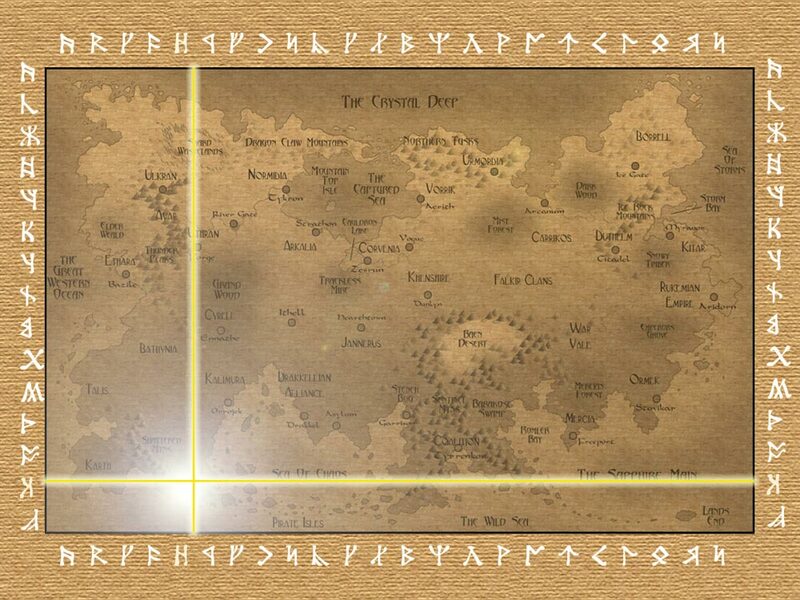 The characters follow the map and have any number of encounters that you want. Each time they check the map, the glowing lines remain steady and the coordinates indicate the south tip of Mercia just slightly out to see (literally a mere 200 yards from shore). 1a. If the characters stop by any villages along the way and ask about the ruins on the south shore, they will hear vague superstitious stories about the haunted remains of a ruined castle. 2. The characters arrive at the castle. 2a. If the characters choose to wait and study/monitor the castle, they see a small group of men and undead, led by an old woman, row to shore in a long boat, walk to the abandoned graveyard and start digging up bodies. 2b. If the characters fight the digging team, the witch should get away. But it's ok if a few of the men and undead die. This might also be a good opportunity for the players to capture one of the bandits. He could be questioned. If interrogated, he can fill the players in on who lives in the ruined castle and what they are doing. He also knows that the witch recently found a set of bones that radiated magic and she is very eager to study them further. If the characters alert to the castle to their presence, the castle goes on high security alert. That means double the guards at critical entrances, a powerful illusion will be placed over the castle to make it look more ruined that it is. 3. The characters sneak into the castle, steal the skull and escape. 3a. A frontal assault on the castle would be sheer suicide unless the characters are vastly powerful. Attempting to scale the outside of the castle and enter at any mid level will likely result in the characters being seen and captured. The best approach is to sneak into through the sea cave and work up through the levels. This affords the best chance of doing a floor by floor search while maintaining stealth. The castle is ancient. It is one of the Traxxian fortresses that was used during the Great War. Although of a different design, it was a part of the same series of fortresses that the Garrison belonged to. It is built into/onto a small rocky island (about 100 yards in diameter) which rests about 200 yards off the coast. It has 3 underground levels (the lowest of which is a sea cave which connects to the open sea) and five levels above ground. The witch has set two dozen of her zombies to the task of slowly and methodically rebuilding the ruin stone by stone. They have been at it for over three years and they are making progress. Keep A bird's eye view of the exterior and balconies..
Levels 6 & 7 Laboratories, spell research and roof. Level 5 The witch's personal quarters. Level 3 Feasting hall, throne room, guard chambers. Level 2 Barracks, training rooms. Level 1 Stables, kennels, entry halls, guard rooms. Sub Level 1 Work shops and mines. Sub Level 2 Prison, well and crypts. Sub Level 3 A large sea cave, hidden dock and portcullis. There are a number of ways that this section of the adventure could play out. The characters may use brute force or stealth. They may do it in a single night or may visit the castle stealthily over several nights. Regardless of how the party does it, they must find and steal the enchanted skull which is held in the castle. Once the characters have successfully obtained the skull, the enchanted map will change to indicate a new set of coordinates (the location of the second skull). Let the players figure this all out for themselves. 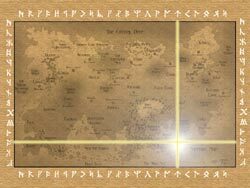 The location of the second skull is in the jungles of Karth. The characters have a long sea voyage to get there. Lots of opportunity for side quests and such.